The author of Scythe takes you to rustic Tuscany where a vineyard is waiting for you! 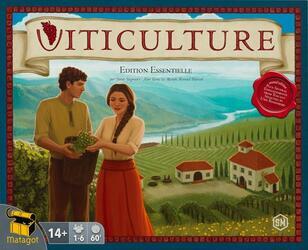 The Essential Edition includes the Second Edition of Viticulture, accompanied by several elements inherited from the Tuscany expansion, selected by the famous author Uwe Rosenberg. Start with a few workers and an old juicer, then exploit your land and hire the manpower of the seasons to produce quality wines. Will you be able to honor your heritage by becoming the best vineyard in Italy?